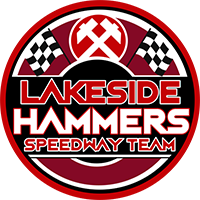 Powerful Lakeside got their SGB Championship campaign off to a perfect start with a convincing 56-34 win over Redcar at the Arena-Essex Raceway. Will Pottinger’s side were never threatened as they roared to 14 race victories and a comfortable three league points. It was another step in the right direction for the Hammers to continue their excellent start to life in the second tier – and Pottinger declared himself happy with a job well done. “Obviously it was another good night for us,” Pottinger said. “It’s great to start our league campaign with a big home win, and also sending the opposition home empty handed as well. “We had 14 race winners and all the top five scoring paid double figures, so it was a powerful performance and we couldn’t ask for much more really. Heat-leader duo Nick Morris and Richard Lawson went untroubled to record a full maximum and paid maximum respectively. But they were backed up magnificently by Adam Ellis, Kyle Newman and Ben Morley, with Ellis suffering just one defeat and Newman capping off a double figure score with a heat 15 victory. He was joined in the final race by Morley, who also bagged 9+2 points with a battling display. Zach Wajtknecht also won heat two with a useful showing at reserve, and although lower order partner Alfie Bowtell struggled, the Hammers had more than enough firepower for victory. Pottinger’s side will now face a run of three straight away fixtures, starting at Ipswich in the Championship Shield on Saturday (7.30). A win at Foxhall could secure progression to the semi-final stage of the competition – and Pottinger has called on them to pick up where they left off to earn their second win of the year against the Witches. He added: “We’ll go to Ipswich with a lot of confidence, and we know a good result will put us in with an excellent chance of progressing from our group. Nick Morris 12, Richard Lawson 11+1, Kyle Newman 11, Ben Morley 9+2, Adam Ellis 9+2, Zach Wajtknecht 4, Alfie Bowtell 0. Ben Barker 12, Theo Pijper 6+2, Kevin Doolan 5+1, Mikkel B Andersen 4, Matej Kus 3, Jordan Stewart 2+2, Tobias Busch 2+2. Championship points: Lakeside 3 Redcar 0. Danny King, Michael Haertel, Rory Schlein, Cameron Heeps, Nico Covatti, Connor Mountain, Danyon Hume. Nick Morris, Ben Morley, Adam Ellis, Kyle Newman, Richard Lawson, Zach Wajtknecht, Alfie Bowtell.